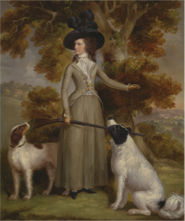 It's my pleasure to welcome Virginia Hill of www.fashionarchaeology.com for a look at hats and English ladies in the 1780s! 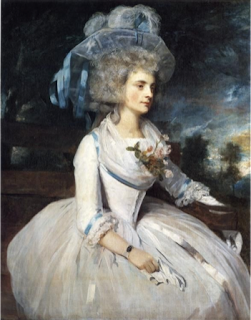 Joshua Reynolds, Lady Skipwith, 1787, Frick collection, USA. Lady Skipwith wears an English gown. There are moments in history when fashion and art just come together in the most splendid way imaginable. The period running from the late 1770s to the late 1780s is one of these. The art of portraiture was living a glorious epoch with the likes of Gainsborough, Reynolds, Romney and Raeburn, and fashion was living its heyday of Anglomania. London was, for a brief moment, the international fashion capital for women’s fashions. Paris was taking its cue from English tailors regarding the riding coat (la redingote) and the English gown (la robe a l’anglaise) but above all it was soaking up every aspect of English culture, from literature to politics, to the idiosyncratic ways of the British aristocracy. The English upper class lived in the countryside and liked to dress sensibly for it (unlike their French counterpart who repudiated contact with nature in favour of the artifice of life at court). Hence the English lady took up wearing her riding clothes not just to sit on a horse, but also to go walking, shopping and do any practical activity which involved staying outdoors, requiring a certain degree of comfort in cut but also in fabric due to the uncertainties of the British climate. These clothes were not only practical they were also very masculine in nature. Their cut and fabric derived from the male coat and traditionally their construction was reserved for male tailors (i.e. the tailors of men’s clothes). The other very characteristic British element of fashion of this period is the hat. Continental women had not been particularly interested in hats in, in fact head coverings (especially wide brimmed ones) had been associated with the lower classes, particularly peasants working in the country side, up until this time. English ladies made hat wearing an art in the second half of the eighteenth century. 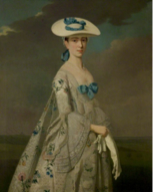 But from the 1750s onwards it became indispensable for a fashionable country lady to wear a light weight straw hat decorated with a coloured ribbon (later also feathers, flowers, etc.) . The trend soon spread to the city and hats were worn throughout the day. Even with the rising hairstyles of the later 1760s and the towering ‘heads’ of the 1770s, the hat wearing persisted. In 1778 Evelina, the heroine of the Fanny Burney’s delightful novel by the same name, comes up to London for the first time and is introduced to the delights of shopping by her more sophisticated hostess. Evelina is particularly taken aback by the experience of going to a classy milliner’s where she is surrounded by ladies so dressed up “I should rather have imagined they were making visits than purchases”. But what really astonished her was the presence of male shop assistants “such men! So fisical! So affected!” and their arrogance regarding fashion “they recommended caps and ribbands with an air of so much importance, that I wished to ask them how long they had left off wearing them” (a veiled criticism of their effeminacy should be noted here). In fact Evelina had unknowingly walked into the new craze that would take over London and indeed the world over the next few years: hats! By the 1780s hats were not just made of straw but of wool felt and beaver fur, the techniques generally used for male hat making were now applied to making huge, wonderful, show stopping creations for women. The bigger the better. Written content of this post copyright © Virginia Hill, 2016. One small point. The reason why the aristocratic French ladies spent all their time at Court was because the French monarch would not allow the courtiers to go home to their estates and possibly plot against him. The English aristocracy observed The Season. They were in London during the winter when Parliament was sitting to enjoy a courtly social round but were able to return to their estates in the summer. This meant that the English aristocracy were far better informed about conditions in the country. And the English peasant was famously better off than the French peasant. The two sets of facts may be linked.